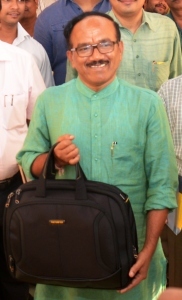 Goa Chief Minister Laxmikant Parsekar on Thursday confessed to have bribed a tout once in the North Goa District Collectorate for obtaining a certified document before he became an elected representative, and said that even after 38 years of pursuit, he had been unable to obtain the document. "Let me confess I was badly in need of that document. I am persistent and I had decided I would source it from this person only. I did not keep track of how much I must have paid to him," Mr Parsekar said, while speaking at a function organised to launch an SMS-based mutation facilitation service in Panaji.